This statistic displays the online shopping frequency of online shoppers in the United Kingdom as of August 2013, by device used. 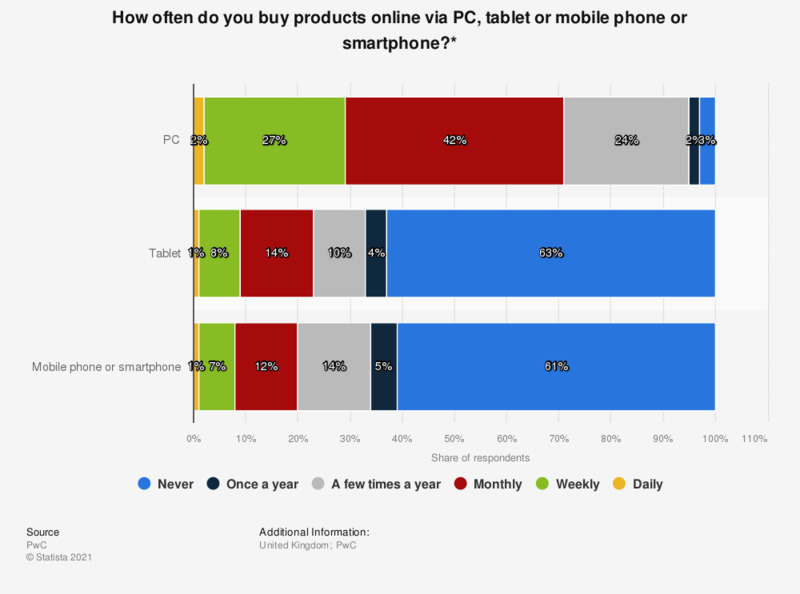 Among UK online shoppers, 27 percent reported shopping weekly via PC. This compares to 30 percent of shoppers reporting weekly in-store purchasing. * The original survey question was, "How often do you buy products using the following shopping channels? (Online via PC; online via tablet; online via mobile or smartphone)"
** UK base not specified. Age of respondents not specified. How often do you buy products using the following shopping channels? Is having the possibility to book a service on the Internet from your mobile (smartphone, tablet) an advantage?